Memory is an odd thing: at times detailed and accurate, at others a blank wall of no recollection about a given place or event, and occasionally it is even a complete liar. 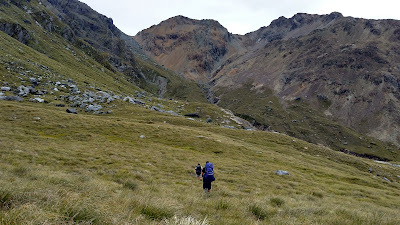 Ten years ago my family did the classic Five Passes route as my first multi-day tramp, which I absolutely loved. Ever since, I have had a hankering to retrace our steps. Returning this summer with three friends, I found my seemingly cohesive memory of the trip to instead be a patchwork of well-remembered portions interspersed with mere snapshots and blank spaces. With the weather forecast looking marginal I debated about pulling the pin but we decided to have a crack anyway, prepared to bail if necessary. Setting off from the Lake Sylvan car park at 4pm it was a pleasant wander along the track to the Rock Burn, from where we alternated between following the Dart River flats and trap lines. The evening was still and clear and we were all excited to be underway. The Beans Burn was cold and cloudy but after casting around we found a crossing place at the top end of the flat on the true left. For the other three it was their first time linking up for a river crossing, and it was my first time being in charge of one. It was 8pm by the time we edged into chilly water, thankful for Brendan holding the line at the top end. It was not quite waist deep but we were glad to quickly put on dry clothes and set up camp at the jet boat landing area. In what was to become a nightly ritual, Brendan and Dan soon had a cosy campfire blazing away. Waking the next morning to cloud down around the tops we packed up reasonably quickly, encouraged by the sandflies, and were soon heading up the Beans Burn. This was one section where my memory played me false; of the 15 kilometres and 6 hours I remembered almost nothing, and some things I thought I remembered weren't so at all. Only one area of maze-like crown fern was as I recollected. Spotting a whio was the highlight of the plod through the bush, with a shadow-like bow hunter and 142m waterfall providing other points of interest. Although the river has now changed course, Split Rock Biv was still the same. With mixed opinions on sleeping in the biv versus camping out it wasn't until after dark that we all finally settled on sleeping in the main cavern - Dan rather reluctantly and only because it's not every day that you get to sleep (or lie awake all night) in a cave. Brendan's pack is like Mary Poppins' carpet bag - you never know what he is going to pull out, but it's always just what you want. This time he proudly produced two candles to ensconce in the rock wall. Dreading what bad weather the day might bring, I popped my head outside at dawn and was greeted by a relatively clear sky. Time to get going. The plan now was to make the most of the good weather and push all the way over Fohn Saddle, Fiery Col and Cow Saddle to Hidden Falls Creek instead of camping high by Fohn Lakes or on the Olivine Ledge. 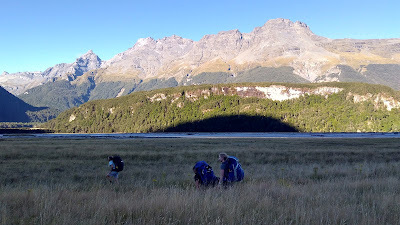 An hour of tussock and scrub-bashing brought us to the base of the first climb. There is no easing into it: the ascent starts off steeply and gets steeper. Clouds were beginning to scud across the peaks as we gained the first of our five passes. Thankfully there was no cloud sitting in the Olivine Valley and visibility was clear. Dropping down beside the gorge draining Fohn Lake was merely hazy snapshots of memory for me but the route was easy to follow. We spotted a large red deer across the other side of the canyon. A brief moment of panic when Dan realised he'd lost his phone and ran back to where we'd stopped for morning tea 10 minutes prior, triumphantly rejoining us a little while later. We spread out along the Olivine Ledge, each picking our own way. Lucy was extremely proud when she found a significantly easier line and got well ahead of the boys. While eating lunch at Fiery Creek a pair of rock wren came to investigate us and kept us enthralled for quite while. Lucy provided a moment of merriment when, with extraordinary relief, it suddenly dawned on her exactly how close Fiery Col was - she had thought it was on the distant range across the other side of the Olivine Valley! Refueled, we made steady progress up to Fiery Col, the highest point on our journey. This was one of the sections I could clearly (and correctly) recollect from last time. Looking down to Cow Saddle I could pick the route we had taken previously, but instead opted to follow the cairns down the true right of the gully which ended up popping us out at the very head of the Olivine. Cow Saddle was an easy third pass with no elevation to gain. The first pool we came across in Hidden Falls Creek beckoned invitingly and we all took a refreshing plunge. I remembered sidling along the base of the shingle slide but this time it seemed to go on for a lot longer. Bodies were getting weary by now and I had to dangle the promise of an excellent campsite ahead like a carrot on a stick. I only hoped my memory was correct. It was. We were soon contentedly setting up camp and getting the fire going. Not a moment too soon as the first light drops of rain began to fall. Deja vu. After a lazy start we eventually set off toward Park Pass. It was still lightly drizzling but we soon stripped down tshirt and shorts when we hit the climb. This was good fun; clambering up tree roots and gaining altitude very fast. Dan was soon out of sight way ahead. Donning raincoats at the bush line, we emerged onto the tussock of Park Pass. With mist obscuring the view and a bit of moisture in the air it was just like last time. No tarrying on pass number four as we blazed on toward the rock bivvy for lunch. It was luxury to have a hot lunch while sitting somewhere dry out of the rain, gazing down the Rock Burn valley. Fond memories of a night spent here snuggled into a cosy sleeping bag. Eventually we decided it was time to carry on and so we blundered our way down the Rock Burn. Scrambling up Point 908 provided an excellent view. Not long afterward Lucy rolled her ankle and fell head first down a steep bank. Luckily a tree stopped her and no damage was done except a sprained ankle. Lucy bravely soldiered on down the rough track to Theatre Flat where we decided to stop for the night. I couldn't remember exactly where the main camp spot was here so Dan and Brendan went to investigate while Lucy and I fossicked for firewood. Of course, we weren't going to leave this plunder behind when the boys returned successfully from their scouting mission. We must have looked like a company of Ents as we made our way to the big rock overhang halfway down the flat. The fire sure was roaring that night! It was a spectacular spot, with majestic mountains all around and countless waterfalls cascading down the cliffs. A kea popped in to case out the joint and left us warily on edge for the night but no mischief was done. Keeaaaa! A harsh cry woke us in the morning and we were greeted by a kea jauntily peering down at us from the top of the rock. None of us were particular eager to get moving; the sooner we left the sooner this fabulous trip would be over. A few more kilometres down the valley led to a steady climb up to Sugarloaf Pass. We ate lunch here on top of our final pass, devouring an assortment of leftover food. 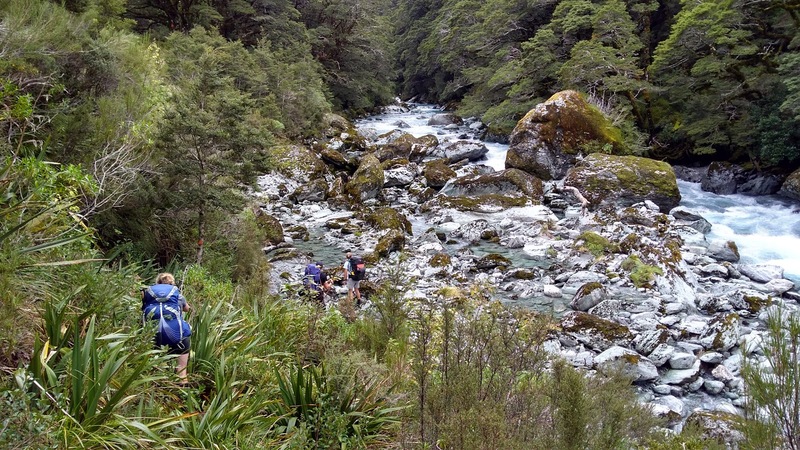 Reluctantly we charged down to the Routeburn Track and civilisation. The wilderness was now behind us. Nothing left but to stroll back to the car. What a glorious way to spend five days!